An important principle of inheritance is genetic variability. All are aware that offspring are not exact duplicates of parents. Within a given species, a gene pool is defined as the entire spectrum of variations of DNA of all members of the species. A gene pool includes genetic material encompassing a wide range of traits. It is also known that despite this variability, a species is confined to boundaries that cannot be traversed through breeding. Traits such as eye color, the shape of one's nose, and blood type are phenotypic expressions of genes that display substantial variability between individuals of a species. These generally involve simple substitutions of nucleotide bases within the DNA. The coding of fixed traits that define individual species such as feathers in birds and lactation in mammals involves multiple specific sequences of genetic code. These traits do not vary in a given species through any known mechanism of inheritance. Although significant genetic variability exists in some traits, other more complex traits do not show such variability. The phenomenon of genetic variability has been harnessed for centuries in the selective breeding of plants and animals. By utilizing techniques such as inbreeding and outcrossing, favorable genetic traits are preserved and amplified within a given species. Many of the fruits and vegetables consumed today are the result of extensive genetic manipulation over many decades. Dairy cattle have been bred from wild stock for their capacity to produce large quantities of milk. The term natural selective breeding is synonymous with microevolution. Microevolution is an unfortunate term, because it implies that it differs from macroevolution only by timescale. Selective breeding of domestic dogs has resulted in ennormous differences in form. All breeds, however, pertain to the same species, Canis familiaris. 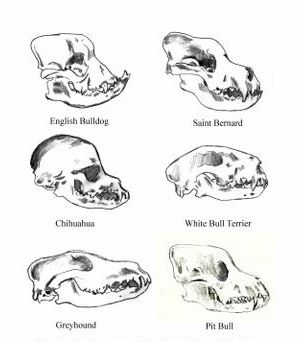 Comparison of skulls from various breeds of domestic dogs. Marked variations in skull shape and relative sizes of brain cases is noted. These are normal variations within the genome. The selective breeding of dogs, which man has conducted during all of known human history, has demonstrated the striking phenotypic variability that can be produced through the selection of given traits within the genome of a species. An adult Chihuahua can weigh between 1 and 6 pounds. This stands in contrast to an English Mastiff which can weigh between 175 and 250 pounds. Both are members of the same species, Canis Familiaris. 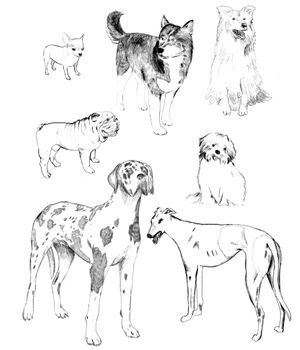 As illustrated in figure 1-2, there are profound differences in the size and appearances of various breeds of domestic dogs, along with many other differences in stature, head shape, hair color and texture, temperament, and physical capabilities. Despite enormous differences, all are believed to be descended from the common gray wolf, and all are capable of interbreeding. All domestic dogs can likewise interbreed with wolves. It is critical to understand that notwithstanding this great variation, all breeds are unified in that all are equally representative of the canine prototype. No dog breed is considered to be transitional to any other species in any way. Each is merely a representation of the great genetic diversity within a species. Another important principle to understand is that regardless of how many breeds are produced and how many different traits are expressed, there is no overall improvement in the species from a survival standpoint. Unlike proposed evolutionary pathways, no increase in complexity or added information into the DNA of the species has been accomplished through selective breeding. Plant breeders have in recent years predicted the future demise of the plantation banana that stock the shelves of supermarkets worldwide. This is because of many years of selective breeding which has resulted in a sterile fruit that has little genetic variability and exhibits increased vulnerability to diseases. * The same observation is true in animal breeding. Many breeds of domestic dogs or livestock would do very poorly in the wild. This is because their traits were selected not for survival advantages, but for purposes judged by man to be desirable. All the genetic traits to produce a dachshund, Pekingese, St. Bernard, bulldog, greyhound and a host of other breeds are found within the gene pool of the gray wolf species. The varying traits of all dog breeds were not "created" through breeding. Virtually every trait of every dog breed in existence has always existed. Selective breeding utilizes techniques to isolate and amplify existing traits which are desirable to man. It is believed by geneticists that all species including humans possess a similar degree of genetic diversity. * Therefore, the potential for variation is equally as great in all life as it has been demonstrated in domestic dogs. In contemplating the degree of change or "plasticity" that can naturally occur within a species, it is reasonable to use domestic dogs as a rough gauge as to the amount of variability that can occur. In Origin of Species, Charles Darwin made repeated references to selective breeding as evidence for the possibility of evolution and referred to its principles in defending his theory of common descent. The principles of genetic diversity as evidenced in the production of novel breeds of animals and plants has been used as evidence that given millions of years, species can diversify greatly. Charles Darwin argued that the principles of selective breeding could be extended to encompass dramatic changes over long periods of time. The observation of the plasticity of species continues to be used today as evidence for evolution. Despite the variation that has been produced in the breeding of dogs, that variation is limited. It is impossible to breed an adult dog the size of a mouse or an elephant. This is because the genetic material necessary for such a transformation does not exist in the DNA of any member of the dog species, nor in the gray wolf from which all dogs are believed to have descended. Likewise, a dog cannot be bred into a horse, cow, or giraffe for the same reason. Although dog breeding has taught us that great genetic variability exists, it has also taught us that sharp boundaries prevent unlimited change. While the breeding of plants and animals is used to justify the tenets of evolution, observations in this area in actuality attest to the impossibility of evolution. Despite thousands of years of breeding dogs, which is far more effective and rapid than natural selection, not one iota of evolutionary change has been produced. Every dog in existence is 100% canine and is nothing more or less. The argument of selective breeding as being evidentiary for evolution is further flawed by the fact that breeding does not result in improvement of the species or any increase in complexity, as is stated to have been occurring undirected in nature for millions of years. The marked variability of various breeds, particularly dogs, also attests to the futility of attempts to designate fossil species as transitional. A perusal of skulls of various dog breeds demonstrates the wide range of possibilities of selection of given traits within a single species. Therefore, it is essentially impossible to assign transitional status to any species without the ability to assess anything more than fossilized skeletal remains. An excellent example of natural selective breeding is found in the study of the Galapagos cormorant, a large seabird found only on two islands in the Galapagos Archipelago. It is one of the world's rarest birds and is unique in that of the 40 species of cormorants that inhabit tropical and subtropical coastal regions worldwide, only the Galapagos cormorant is flightless. Although this species is commonly cited as a classic example of evolution, evaluation of this bird reveals that its differences with other cormorants can easily be attributed to natural selective breeding. All cormorants are excellent swimmers and feed on small fish and marine invertebrates. The only unique feature of the Galapagos cormorant is its short stubby wings which are approximately one third the size of the wings of other cormorants. The modified wings are utilized as paddles in swimming. It is believed that because this cormorant was isolated in the Galapagos Islands where no large predatory animals exist, it lost the ability to fly and became better adapted to swimming with its shorter wings. Given the geographic isolation of the Galapagos Islands, substantial inbreeding would be expected among relatively small populations of birds within a unique ecological environment. Utilizing the selective breeding of dogs as a gauge of the extremes of genetic variability, it should come as no surprise that a breed of seabird could be achieved with short flightless wings. A dachshund has been selectively bred for short legs and cannot chase prey like a greyhound. A Pekingese cannot hunt and kill a deer like a wolf, because its physical capacity has been diminished. Given these observations, it is reasonable to assume that the ability to fly can be naturally bred out of a species by selection of traits resulting in the alteration of its anatomic proportions. In all other features, the Galapagos cormorant is not fundamentally different from other cormorant species. No behavioral evolution took place. Despite the fact that the Galapagos cormorant spends much of its time swimming underwater, its feathers are not waterproof, but are identical to those of other cormorants. A conventional cormorant could undoubtedly be selectively bred into a flightless cormorant. No increase in genetic information would be required. No behavioral changes involving added or fundamentally changed sequences of genetic code would be necessary. It is not surprising that a conventional cormorant, through isolation and inbreeding in a unique environment, could undergo this sort of degenerative change such that it loses the ability to fly. Such an observation does not in any way justify the conclusion that reptilian scales can evolve into feathers and that a land vertebrate can gradually acquire the ability to fly. Loss of the ability to fly is the result of inbreeding and/or a loss of genetic information. Acquisition of the ability to fly would require a net gain of thousands of genetic code sequences.